The family of a northeast Iowa soldier who died in Afghanistan on April 22nd has released more information about his death, revealing he died of a heart attack. The Department of Defense released a statement last week, saying Command Sergeant Major John Keith Laborde of Reinbeck died in a “non-combat related incident” at the Kandahar Air Field in Afghanistan. A family spokesman says Laborde complained of dizziness right before the collapse and a nearby soldier “caught him and guided him to the ground.” He was unresponsive and soldiers in his unit performed C.P.R. as they waited for an ambulance to arrive. Medical examiners have listed cardiac arrest as Laborde’s cause of death. 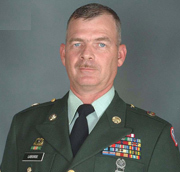 Laborde had a 31-year career in the military and he was the highest-ranking enlisted soldier in his unit. The governor has ordered flags in Iowa be flown at half-staff Saturday in honor of Laborde. A funeral will be held Saturday morning at St. Gabriel Catholic Church in Reinbeck and he will buried at a cemetery in Oelwein. A vigil service will be held tonight at the church, starting at 5 p.m.